This dress' story starts long ago, 5 years ago really, back to when I was a young, new costumer. It was 2004 when I attended my first Renaissance Festival, and I was hooked. My friend said it perfectly when she described her own first trip to the Renaissance festival, she had always been a costumer, just never knew it until then. Exactly! 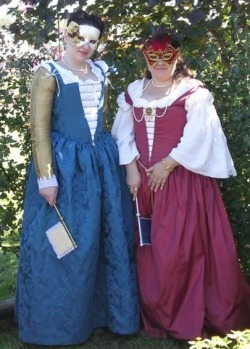 I did some Victorian sewing for a couple of years, and came back to the Renaissance in 2007 when I thought I'd be making out to the MNRF again and to take part in the Pink Venetian party that was happening at Costume College that year. Though I didn't make it to CosCol that year, I made the dress in spirit of it. So far, this dress has had alot of reworking and I plan on doing more. 1. The straps are slipping. This is due to a lack of experience (at mocking up) in making my own patterns. 2. the bodice is BIG here, making the V opening small. This is not ideal for my tastes. 4. What sort of camica is that? It's not, it's a chemise that I bought at Ren Fest a few years before and was forced to wear it because my camicia wasn't yet finished! The next time I wore this dress was the Northstar VSA's Masquerade Ball. I took the dress in and made a pair of gold sleeves...this was my first pair of sleeves...so I didn't know where the proper placement for the loops was and because I was in a rush sewing the loops in the car on the way over (with someone else driving :P) I had to wear them wonky. The 1st picture is from the first day of MNRF 2009. In this picture, you can see that I've added trim to the front opening. I did this to mask the fact that it was the trim strap that corrected the strap slipping issue. This isn't intended to be a permanent fix, just a quick attractive fix so that I could wear the dress for fest.